Thomas Oschwald has an amazing plan. Beginning of June he will go on a fascinating SUP adventure. He will attempt to paddle from his home in Mollis, Switzerland to the Atlantic Ocean – and back. 5000 km in total. This would be world record. The current official record is held by Tom Jones who standup paddled the length of California from Oregon to Mexico (1,250 Miles in 90 consecutive days). Thomas will go on the trip totally alone and has consciously chosen to not be accompanied by a boat or take any other external help. He will carry all the gear and equipment needed and take care of he catering himself. A true adventure! But he will try to report to us more or less live from the journey and also publish his current position on www.surfline.ch, so that other paddlers can check it out and accompany him for a few miles or days. 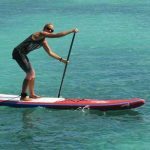 SUP-guide: Thomas, 5000km on a SUP, what a crazy plan! Tell us about yourself, when did you start with SUP and how did that idea come to life? To be honest, I have been surfing for a long time, but only started SUP half a year ago, in November 2010. The idea crossed my mind when I was watching Stand Up Paddlers surfing ocean waves in the Atlantic last summer. About 10 years ago, I did already walk from Switzerland to the Atlantic Ocean in 18 days to surf a few waves, so guess I have always been attracted by challenges. My career development from finishing school to becoming a self-employed photographer and webdesigner was a challenge, too and have influenced me very positively until I realized I am only running from job to job and it’s time for another, bigger challenge. With this project I will leave my beaten path and start a new way of life. SUP-guide: Such a trip must be quite a logistical challenge. How did you plan the route and how do you know where you can paddle and where not? Initially, I wanted to paddle 1500km from Switzerland to Hossegor, France and then I started wondering if there is any chance of paddling back. Experimenting with paddling against river currents and internet research then led me to change and extend the route to 5000km. I am on purpose not planning the route to every single detail, going on an adventure for me also means dealing with the unknown. I don’t want to be forced to stick to a plan, I want to be able to make decisions on the way. I am only about 60% sure that I will paddle all the way, but this is perfect for me. The risk of failure must be an option. I want to deal with the challenges as they arise, as this is what makes you grow! SUP-guide: How do you physically prepare ? Currently, I am training 2-3 times per week on a mountain lake. I am working on my paddle stroke and my endurance. Most sessions last about 5 hours. I am not a big believer in training plans, I don’t want to win a race. I want to choose a new way of life in which I am free to make choices. But I want to avoid injuries so I do take the training seriously. 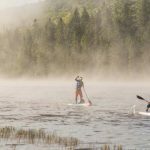 No matter how cold or windy it is, I go paddling, and I can recommend paddling on a snowy mountain lake to everybody – a truly amazing experience. SUP-guide: Will you paddle all by yourself ? Yes, I have chosen to go on the trip alone, as this is pure freedom. I want to be free but share my knowledge and experience with other paddlers. 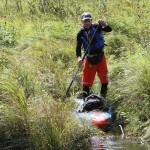 It would be great if other stand up paddlers could check my position online and would accompany me for part oft he way. As an individual in a society I am seeking freedom without actually leaving society. For me freedom is being able to be honest to oneself, hence it is best to start this project by myself and then see how things develop. SUP-guide: Taking some time off to go on a big trip is something many people dream of. Any tips how to make it happen and how to finance such an adventure? I think the most important thing is to make a decision and then do everything to live this. It’s bad to dream from one thing and live another and even worse is telling oneself something is not possible. My life is series of decisions and the path is based on my choices. Dreams cost money, that’s for sure. My sponsors help me and this enables me to realize the project in such a short time frame, but I am convinced I would nevertheless find a way of doing it. We can experience adventure and challenges in our everyday lives, we don’t have to travel to he end oft he world. It’s all about perspective. Don’t talk about dreams, live them! 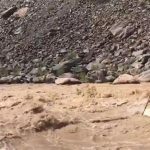 SUP-guide: What do you think will be the greatest challenge? Not to pass boundaries that will to physical harm to my body. Sometimes your mind is stronger than your body and it is not always easy to recognize the. Making the right decisions with respect to that is he greatest challenge and will decide if I succeed or not. SUP-guide: Thanks and all the best for your trip. Take care! Looking forward to amazing photos and stories.